Building UPVC conservatories without some careful planning and strategies may not offer you complete functionality and durability. Before you actually decide about the various aspects of your UPVC conservatories, considering some important things will make the home extension an enjoyable and comfortable place for the whole family. When you meet your supplier for the detailing of the conservatory design, make sure you understand all the measurements correctly. When he lists out the size dimensions, it is always advisable to ask if these are from inside or outside the structure. The reason is that you must be more concerned with the floor area while the builder will generally talk about the measurements from outside that have a considerable difference. Before you start executing the construction project, you must make sure it does not require any type of planning issues or permissions before beginning with it. It may not be in every case, but it is better to be safe than sorry. For each type of conservatory, you are selecting as an alternative, find out the planning permissions required by them. For simplifying this, you can seek help from your neighbors who have erected such constructions already. They can be guide you informally about the planning permissions allowed and required in your own area and what limit will be acceptable. You may also call into your local authority and make things clear for yourself before you have initiated the construction work. It is important as well as very much relevant to mark the ground with a string and pegs or with other things, the internal boundary of the conservatory. This is helpful for a good idea of the ground that will be covered in your conservatory and how much space will be created for the new room. This is helpful in planning for your furniture and decoration for the new room in advance. It is also important for you to compare the market quotes before you select one vendor. The cheapest option may not always be the best one for you. Too cheap conservatories may be a potential hazard for your family members. Though very tempting to look at, excessively cheap quotations must be avoided for the sake of your family’s safety. You can plan some things that you cannot do without in your conservatory. Do not negotiate over these issues; if you want them, you want them at any cost. In under construction UPVC conservatories, you can add a cavity tray in the walls above the level from where the roof will begin. This is helpful in preventing moisture to get down into the cavity of the walls and appearing with ugly stains. As another construction tip, it is important to not to place your conservatory door at a point from where your room looks like a hallway. This can ruin the whole idea of a functional and spacious conservatory. A conservatory will look spacious and comfortable if you add a door in the middle of the large glass window. It can also differentiate between two differently used parts of the same room. This Blog is Mobile Compatible – Is yours? This blog has been made compatible to mobile browsers by webile blog conversion service. If you visit the blog from your mobile phone, you will find that a slightly different version shows up. A compact view that is easy to load and read on the tiny screens of the mobiles. With the increasing proliferation of the smartphones like iPhones, Blackberries, Treo and Android based phones, more and more people are accessing the Internet from their phones. In some countries, mobile access is more than regular desktop access. So if you want your blog to be more reachable, you can check out their webilize service. The price is so low, you might actually get a shock. With soaring prices of fully fitted conservatories, DIY conservatories offer some sigh of relief and contentment because you can actually save some money and maintain your household budget. The only important thing is that you must have some idea about carrying on this work entirely yourself. You can always take help from your family and friends who have some prior experience in erecting DIY conservatories. It is advisable that if you have neither any basic understanding nor any time to learn it or any assistance, you must go for professional help in erecting these pre-framed components. A ‘do it yourself conservatory’ is the one, which will not require too much investment. The name is self-explanatory, a do it yourself or a DIY conservatory will require you to eliminate the costs of the labour. Some DIY conservatories may require you to build it completely yourself or erect up some components that have been pre constructed by your vendor. If you want expansion to your home but have a restricted budget for it, you can opt a DIY conservatory. It is a viable and easy way to save some pounds as well as give your home a beautiful extension bringing in the outside environment. However, you might need some skills and abilities in the construction area. In addition, there is a unique sense of satisfaction you obtain after you have made your own conservatories. It is important that you do not fall for the inferior materials in order to save some few extra pounds on DIY conservatories. Cutting down your construction costs is more than enough and can enable you to purchase quality components from a renowned and professional vendor. You can find a manufacturing company that can customize the components on your special needs and requirements and help in developing a perfect house extension for you. When you have decided about your vendor and the type of UPVC conservatory you wan to build yourself, there will be a rush many of many other things that will need some more wise decision making. There are various designs and appearances you can give to your home extension. Deciding one out of all the options must be based on the current design of your house exteriors. If your home exterior can match well with an Edwardian style conservatory, you can buy that or you have other options such as P shaped UPVC conservatories or lean to conservatories. A modern home will look best with contemporary style conservatories. It is important that you select a style that can easily blend with your current building style. It should not be bold enough to overshadow the design of the house nor too simple to be overshadowed by it. While making your conservatory yourself, you also have to decide about the uses and functions the new extension is going to serve for you. Another important consideration is approximating the size and structure. It is not advisable to build large structures just because you can afford them by doing yourself. 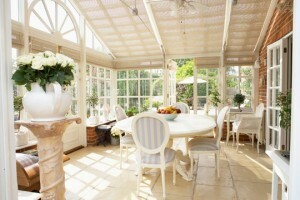 DIY conservatories should just be apt for your needs, any larger, they will need unnecessary investment and maintenance. Conservatories: What is a conservatory? A conservatory is a room with glass walls and a glass roof, which is attached to a house. According to the Department of Environment, a conservatory is defined as “a building that has not less than 75% of its roof area made of semi-transparent material, and not less than 50% of its wall area made of glass.” A conservatory is also referred as a place to store something, i.e., food. It can be used as greenhouse also. The conservatories are used in UK homes to make them look elegant, i.e., attractive, graceful, stylish and multi-functional. A conservatory can be made of expensive woods like oak, maple, mahogany, cedar and modern materials like plastic or glass. Plastic or glass conservatories are more popular because they provide maximum insulation for heat and are important for energy efficiency. There are different types of conservatories used by homes in UK. 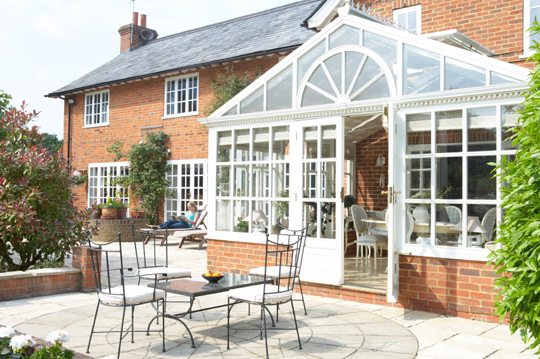 These four type of conservatories are famous for their elegant exteriors and classic designs. This type of conservatory has elegant interior and exterior finishes that made with aluminium. This conservatory is a small roofed building providing shade and rest. It is an ornamental garden pavilion, designed to allow light and air inside it. Gazebo conservatory is constructed of light metal or wood. Georgian architecture was the style of the 18th century, especially from the reign of King George I who ascended the throne in 1711, into the reign of King George IV. In residential settings, Georgian design as the red brick house, with courses and cornices of white stone and trimmings of white painted woodwork, is best example of Georgian design still prevailing in the 21st century. With the early Georgian period, the conservatory itself was first fashioned by the Dutch as a way of protecting plants from harsh winter conditions. In little time, the conservatory was introduced in the British Empire and became a standard fixture in the splendid Georgian mansions constructed during the reigns of the four King Georges. This conservatory is structured with 45 degree corner facets and have beautiful ceilings which are usually made of stained glass. 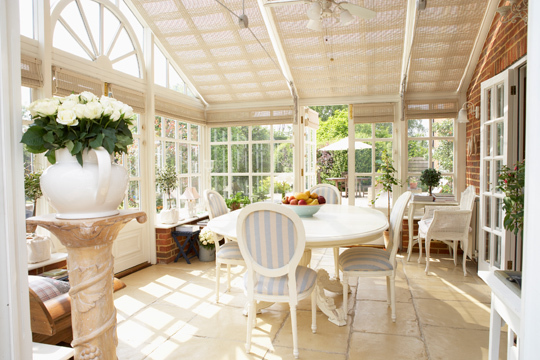 An Edwardian conservatory is constructed with convectional styles. Another type of conservatory which is best for sunny regions is the Sunroom kind which has unique architectural designs with beautiful framed windows and multi-lock mechanisms on their doors. Sunroom conservatories are constructed with polycarbonated roofs for increasing insulation and light diffusion control. Conservatories are usually versatile. It can also be used for different purposes according to season. During hot summer, a conservatory can allow fresh air to enter while keeping insects out. They can also be made into greenhouses because they are built to absorb the external warmth around them and release it inside the room. The other rooms on homes which are not frequently used can also be made into sunroom and can be controlled with their cooling and heating system. Lastly, the conservatories not only add up extra room for UK homes but also makes the home more valuable because the real estate brokers usually put high values to these homes due to their versatility, elegance and convenience. Planning to add a uPVC conservatory to your home? You need to make sure that you choose the best possible supplier who can get the exact product you have dreamt of. An experienced supplier can give you advice and guidance when it comes to decide what’s the best choice for your home. You have to consider the shape, size, placement of windows, conservatory doors etc. The supplier can alter the standard designs and freeze a standard size or go for a bespoke size. There are many options available while designing a good conservatory. A good supplier offers a wide range of options with best possible solutions when you are in a confused state, like you have seen another property, got attracted to it and can’t accommodate that design in your case. The price of a conservatory is to be considered as an important factor. Make sure you have a clear picture of your maximum budget because often the landed cost of a conservatory is more than you have thought earlier. Also provide for extras like fittings and accessories and do not spend all you have got on the basic conservatory only. You can get a lot of information about your conservatory and the supplier profile by checking up the Internet. Follow it up with a call to the supplier and verify details as sometimes, the website may not have been recently updated. While you should carefully consider the options presented by the vendor, do not get too excited by a great sounding offer and deviate too much from your initial decision. Warranties, guarantees and after sales customer support should be an important part of selecting the right conservatory supplier. We need assurance and support from suppliers in case of any manufacturing defect or a sudden deformation in your conservatory, you should have recourse to a remedy at none or a small cost. Get references. Check out your neighbourhood or a friend. Social media on the Internet is a great reference source. You have to make sure that the vendor offers quality products and takes responsibility and quick action when things go wrong. In order to keep your conservatory in tip-top condition, you will need to clean it. Regular cleaning reduces the need for maintenance as dirt and grime causes discolouring and corrosion, making your conservatory looking dull. Job 3) clean framework etc. We can also break the jobs down further into inside and outside tasks to make our work easy. The following procedures should be considered while cleaning our conservatory. Remove plant material like leaves, twigs etc from gutters, because it can severely limit surface drainage, providing a moisture rich environment for moss and algae, and in severe cases if it is left unattended then it can lead to panels and roofs moving. The roof of your conservatory takes a beating from the elements like rain, wind, snow and ice which can all carry small particles of dirt. This cause dirt buildup and reduces the light coming into you conservatory actos 30 mg. This is also the perfect breeding ground for algae, which gives your conservatory an unattractive green coat. Procedure 3: Cleaning the glass. The window of your conservatory will become dirty just like the window in the rest of your home and it should be cleaned up properly and regularly. Procedure 4: Cleaning the framework. Over time, the framework of your conservatory will pick up dirt and grim, and should be cleaned at regular intervals to keep that gleaming “new” look. The internal framework and glass is in much harsher conditions than the external. Many of the pollutants are much more concentrated compared to outside. If you live in a house where someone smokes, your conservatory can be exposed to enormous amounts of smoke and nicotine which results in unsightly yellow stain after sometime. While cleaning your conservatory, safety should be kept in mind. Make sure you are using the correct equipment for the task in hand and if you don’t have the correct equipment for the job, please don’t even attempt any of the tasks mentioned. There are many conservatory cleaning companies out there, who can provide a thorough and professional service. Regular maintenance as per these guidelines can help you cut down on expensive conservatory repairs. Glass Roofing is the basic structure that distinguishes a conservatory from the house. Most conservatory roofs look simple and similar to a layman, but the design, fabrication and installation is not quite so simple a procedure. There are companies that specialize in developing roofing systems. Most of the conservatory installation companies purchase the roofs from the bigger companies that specialize in roofing systems. In order to understand conservatory roofs, we must discuss its three different aspects separately. If you have a conservatory website and want to get in the top10 ranking so that you can get a regular flow of leads and online sales, contact Arun of www.webmaintain.co.uk on +91-98310-27107 or 01274-792525. He runs a popular web maintenance service that takes care of improving your search engine ranking as well as keeping the content up to date. Thinking of adding a conservatory to your home? Are you unsure about how you are going to maintain it? Well, it’s not quite so difficult these days! With the advancement in science and technology, in an era when man is thinking of settling on the moon, why leave our poor homes in the shackles of age old wooden and aluminum frames. As if the doors and windows do not already take up considerable effort and expenses in cleaning and repairing. To think of an entire conservatory in wood can be quite old fashioned and expensive. PVC or PolyVinylChloride has revolutionized the home and construction industry. PVC has become a part of our lifestyle from small things such as torches and table mats to big things as pipes and doors. Improvements in PVC brought UPVC or Unplasticised PolyVinylChloride. UPVC is hardened PVC which is used in making doors, windows and conservatory frames. This material commands certain advantages that have contributed to its popularity and surge in demand. Occasional cleaning with soapy water is all that is required to keep it sparkling. The colors do not fade or peel. No need to repaint after a couple of years. Combined with self cleaning glass, they are the ultimate solution for the conservatory where climbing the roof top is difficult. Non reactivity to water prevents swelling, rusting, rotting or warping. It is built to resist strong winds, stroke and sunlight. The corners are made extra strong to prevent deformation. The UPVC profiles allow for single, double or even triple glazing of conservatories. Double Glazing insulates the conservatory against heat loss, thus saving on energy bills. It also prevents the buildup of fog during rains. Double Glazing is nowadays becoming a standard in wooden and aluminum conservatories too. The profiles are constructed on state of the art machines. They do not have gaps for rain water to seep in. There is no risk of leaky roofs. Its molecules do not allow permeability of sound waves. Thus, your neighbors are not disturbed when you party. And the car honks do not disturb you while you study or relax. They come in variety of designs and colours that will make your orangery gel with your existing house. You can also opt for wood grain finish on the exterior and/or in the interior making it look like a wooden orangery. UPVC can be made from recycled plastic, thus making it eco-friendly. uPVC is not easily inflammable. It requires very high temperatures for it to catch fire. Thus it helps in stopping the spread of fire. Whatever be the benefits, PVCU takes a back seat in terms of look and feel. It cannot match the grandeur of wood or the sophistication of aluminum conservatories! They are good insulators, but not as warm as wood. They are strong, but cannot withstand weather conditions as much as aluminum. They are available in various design and colour combinations, but do not provide a canvass to an architect’s imagination. There have been complaints of UPVC conservatories causing excessive glare. The original roof design, projection and location should be checked to avoid too much of direct sunlight. External coatings that reflect UV rays should be used. That taken care of, all other things that go into building a good conservatory automatically fall into place when you use uPVC as your material of choice. The design, material and placement of the conservatory doors can enhance or destroy the use, look and feel of your conservatory. Bi-folding doors—These doors consist of 2-3 framed panels that are joined by hinges. When opened fully, they fold onto each other in a zigzag manner. They are very useful in large conservatories with big openings from the outside. They allow a lot of people to enter the garden room at the same time. It is possible to open the door only as much as required. Tilt and Slide Doors—These are the most innovative doors available today. It tilts horizontally like a see-saw——allowing in fresh air and sunlight and protecting from rain. Alternatively, it can also slide against a fixed side panel, allowing free passage to people and furniture. French doors – The classic double doors can be adapted to any home, style and size. They can be made to open either inwards or outwards. Width of the doors can be increased for larger openings to give a royal look. Unlike other doors, they give 100% access to passage. Very popular as conservatory main doors leading to the garden. Smaller versions also used as side doors and back doors. Inline Sliding doors — Commonly referred to as patio-doors. Consist of 2-3-4 sashes that slide on rails and collect to one side when fully open. Can open up to ¾th of the door aperture. There is no wastage of space. Widely used as doors joining the home and the garden. Single-swing doors — These doors may open to an angle of 180 degrees. Here again, there is no space wasted. Quad doors with screens (twice the opening for maximum access and ventilation)— it is like an extension of French doors in the form of two bi- folding doors. Sunrooms are built with a motive of obtaining maximum natural light and air. Keeping this in mind, the doors are made of transparent material such as glass or uPVC. The type of glass used for doors and windows of conservatories is toughened glass with single, double or triple glazing. Glazing is a process by which two sheets of glass (say of 4 mm thickness) are sealed with a gap of 16mm. This gap is filled with Argon Gas. The double glass makes it harder to break in. And the Argon gas prevents loss of heat from within the house. Even PVC doors and windows come with glazing options. No matter how much of light is required, the glass used for the doors and windows need not be plane and jane. Decorative glass such as – Diamond /Rectangular leads, coloured glass, stained or beveled glass, sandblasted glass and transfers may be used. The door frames and rails are made of wood, aluminum or PVC. Wood has been a traditional choice for conservatory doors and windows not only for its warmth and aesthetic looks, but also for its insulating properties. However, it is expensive and requires regular maintenance. Aluminum is used in garden rooms mainly used for keeping plants. Modern sliding doors, French doors and tilt and turn doors in aluminum give a contemporary look. Improved versions of unplasticised polyvinylchloride (uPVC) provide a combination of aesthetics, safety, insulation and least maintenance. Drainage issues must be discussed thoroughly with the door providing company. Modern doors are constructed in a manner that addresses the problem very well. It makes the doors last longer. Energy saving options must be explored. Special type of film coating reflects back UV rays of the sun. Double and triple glazing make the doors and windows better insulators. Blinds are used to save the sunroom from getting unnecessarily hot. Safety features of the doors and windows have to be enumerated. Each and every aspect of the doors, from the hinges to the mounting of glass, from beading to the putty line, from handles to multipoint locking system have to be built so that it may protect the house from break-ins. Keeping in mind the above points, one can go a long way in selecting the right door for their conservatory.